When you first decide to raise chickens and you start doing your research, you will quickly learn that you will need feeders, waterers, grit dispensers, nesting boxes, and a coop/run for them. But here are five essential everyday tools that I bet no one told you about. After putting my hand into a dark nesting box and wrapping my fingers around a field mouse instead of the egg I expected, I decided that I need to keep a flashlight in the coop. I now shine the flashlight into each box before reaching in - and good thing because it has saved me from touching a baby black snake and some pullet poop (yes, my chickens sometimes like to poop in one of the nesting boxes). A flashlight in the coop comes in handy to do a quick headcount if you hear a commotion during the night and run down to the coop in a panic in your pajamas and stocking feet and forget to grab a flashlight from the house (don't ask, long story). You can also use the flashlight to candle eggs under a broody hen, and it's not a bad idea to check your chickens' vents at night occasionally for mites or lice. Here's another fresh tip: Add the flashlight app to your cell phone instead! I keep a plastic paint scraper in the coop to scrape the roosts, dropping board and ladder to the nesting boxes. When I clean the coop, it's perfect to scrape up any poop on the floor as well. No better poop scraper. The plastic ones are super inexpensive, so a second one comes in handy to scrape wet feed out of the feed tubs or dishes. But if you have an old metal one, or even a kitchen spatula you're not using any more, relegate it to the coop! A plastic squeeze bottle is the best way I've found to dispense DE (food-grade diatomaceous earth). Fill the bottle and it's a breeze to apply the DE as an insect repellent around feeders, in the nooks and crannies of the coop, in the nesting boxes or even to dust the chickens' butts and under their wings (after dark while they are on the roost is the best time). A small folding knife is useful for so many things around the coop. I use mine to cut the strings on bales of straw, to cut open feed or supplement bags, to chop vegetables from the garden for the chickens and ducks, and once even to cut a snake in half that had wrapped around one of our duck's bills and was trying to wrap its body around the duck's neck to strangle it! I spotted this small fish net at the dump and decided it needed to come home with me. I have used it to skim leaves and debris out of the duck pool, to scoop eggs up when they are laid in less-than-convenient places like under the porch or tucked under a bush, and even used it to scoop a pullet out of the tree where she had decided to roost at night. I use the bamboo handle end to 'encourage' the ducks back to their house at night and keep them headed in the right direction. So there you have it, five common, everyday items. None are very expensive and they will help you in your chicken keeping immensely. If you enjoyed these tips, be sure to pick up a copy of my book 101 Chicken Keeping Hacks available for pre-order now from Amazon.com. 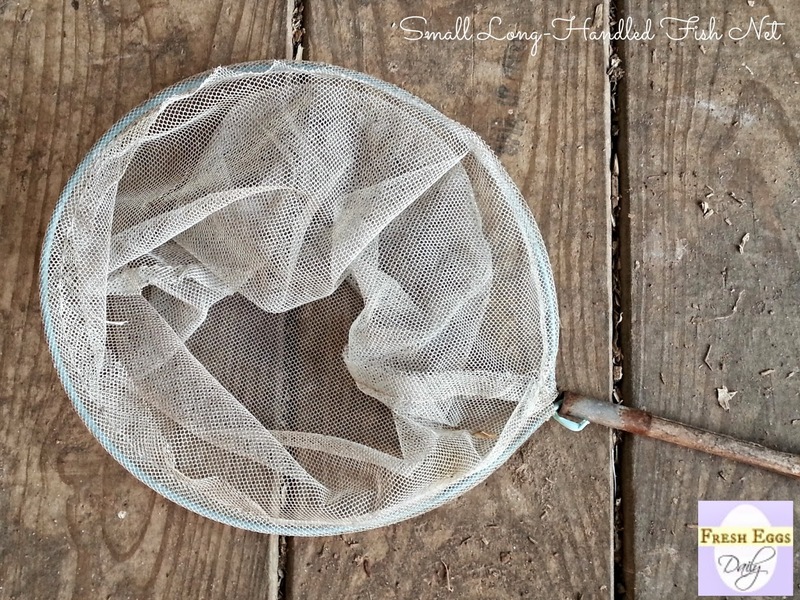 I was eyeballing that mesh basket-thing in the photo... that would be perfect for fishing meal worms out of the box. Great tips! That you had to cut a snake, made me shudder! Hope I never run into that situation. This is wonderful! You are so right, these tools are all very handy to have at hand when you're working with chickens! Great post! Very good ideas, especially the flashlight...I wouldn't want to be pulling a snake out either. My favourite tool is this child's rake I bought at the dollar store. It's still metal, and sturdy enough to pull out things, but perfect for cleaning out straw and other oddities. (dead rats/mice) Couldn't have my chickies without it!